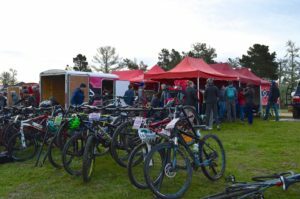 In the first wave, our Category 3 riders hit the course at its wettest, in a light rain following a heavy overnight soaking. At the feed zone, we were thrilled to see Liam Bishop fly past in close contention for the race lead. Later in the first lap, he was already experiencing the severe cold in his hands that would lead to his withdrawal from the race. Get ’em next time. 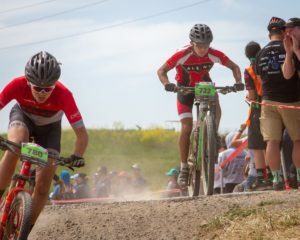 Fellow sophomore Tyler Chace rode with an injury, but didn’t show it, keeping up a strong pace throughout and, according to other observers, pouring on the speed ahead of the finish line, where he finished first of junior men 17-18. April Beall kept up a strong, consistent pace the whole ride, and seemed to be enjoying herself in spite of the rain and mud, coming in eighth in her category. 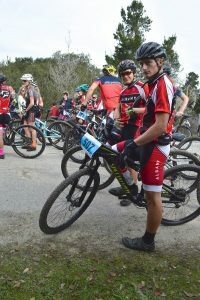 First-year rider and sophomore Armaan Khamenian handled the course’s challenges with apparent ease, though he admitted later the wettest parts were pretty tough. Still, he left the course with a smile on his face. 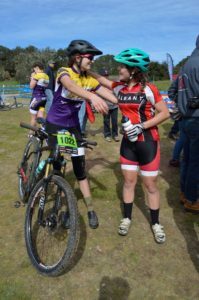 Nicole Hempel comes from a racing family, so her comfort with the whole experience comes as no surprise. She raced in a raincoat, but didn’t seem to mind the mud. In a month, she’ll be back on the same terrain and ready to shred. 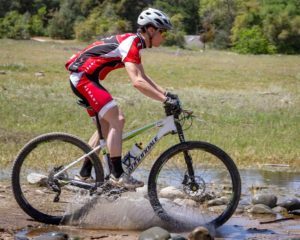 First-time racer Liam Tegland cruised through all the sloppy terrain, kept up a steady pace, gaining good pre-season experience. If it rains at the next race, he’ll definitely be ready. Junior Phillip Son, in his first race, found himself on the podium, showing that the real opponent is the course. He pushed himself, had fun, and in his small age group, was rewarded for his efforts. 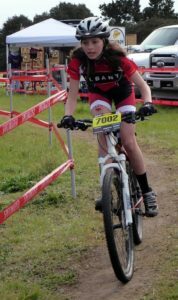 Veteran sophomore Victoria Pras led the Albany category 3 girls, smiling as she sped past, always looking for the next competitor to overtake. She took second in her category. First-year rider Anjelou Parafina rode well on the slippery terrain during the Saturday pre-ride. 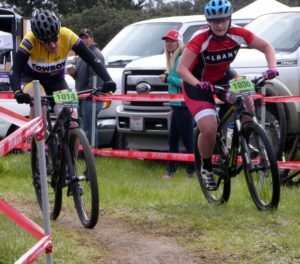 It was a hard race in the rain Sunday, and we’re looking forward to seeing her take Fort Ord on again in March. 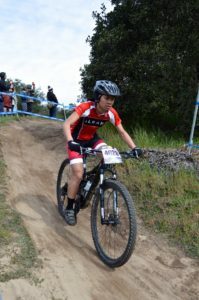 Gabe Botello, another first-year sophomore, just on his third day of riding clipless, raced strong and finished well. He seemed upbeat after the race, looking forward to his next challenges. Claire McNally raced for the first time today as well. 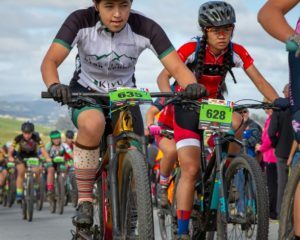 She could have let the rain and mud discourage her, or let a second-lap problem with her clipless pedals sideline her, but instead she got back on her bike and kept pedaling, cheered on at the end by teammates Ella Lopez and Victoria Pras. 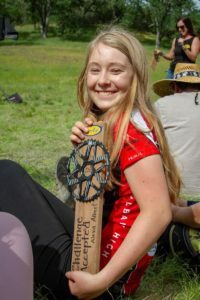 Bird Hudson unintentionally dismounted over the handlebars early in the race, injuring both arms, enough for the medical attendant to send her to the hospital, but not before finishing the race, a strong seventh position in her group. 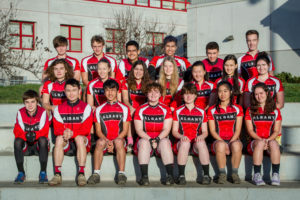 Freshman and first-timer Matthew Murray led the Albany category 3 boys after Liam Bishop’s withdrawal from the race. He charged hard, rode well in the muck, and made a mark his first time out. 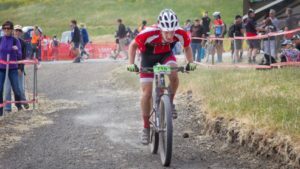 Freshman rider Tristan Whalen took all the mud, rain, and competition in stride, finishing the race and getting in some good experience before the season starts next month. Sophomore Justin Wong-Shea paced Albany’s category leader Matthew Murray throughout the race, and crossed a minute behind him. He admitted later he might have kept too much effort in reserve. Ella Lopez smiled each time she passed the feed zone. It looked like she found her cadence in this first race, then stuck with it till crossing the finish line a strong sixth in her group. 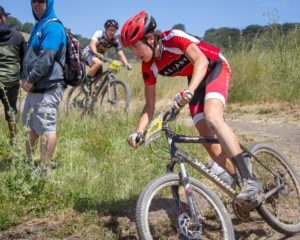 Alexa Albert had a good first race, too, staying in control and having fun on the course at a good speed. 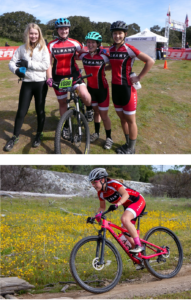 She finished fifteenth in her category, cheered on by teammates Ella Lopez and Victoria Pras. By the time the next race started, the rain had stopped, but the course stayed plenty wet. Team Captain Abegail Shores got onto the podium with her time around the course. Maybe it’s the smile, but nobody seems to mind when she passes them. Giacomo Prioreschi had an unfortunate collision with one of the low branches that cross the path. 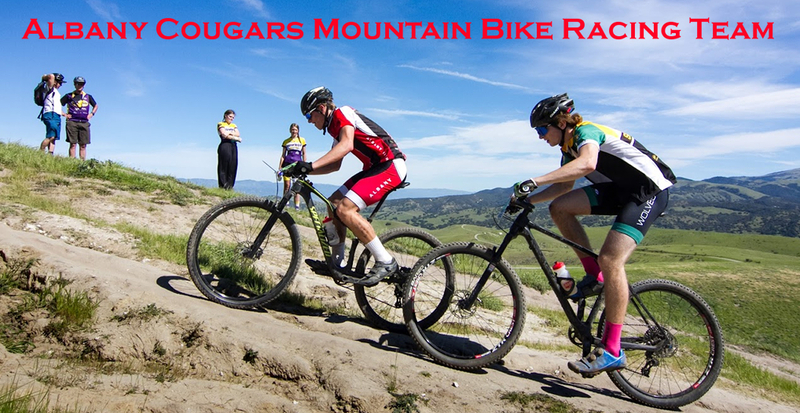 He rode out to the first aid station and received treatment for a mild concussion. We’re looking forward to having him back after a doctors gives him clearance. Alex Hempel cruised through his three laps and made it look easy. He must not have broken a sweat, since he was still on his first water bottle at the end of the race. Niko Lopez sailed past the feed zone at a nice, quick pace, taking eighth position in his age group. His results show he was riding hard, but he always looked like he was just out for a nice ride. Spencer Pras earned the fourth spot on the podium, looking confident and in control when he passed near the feed zone, picking up the pace and passing riders right in front of us. Assistant Coach Marion Russell overtook our Faculty Sponsor, Dean Becker, near the end of their final lap, but he put up a valiant fight and closed the gap in the last stretch. 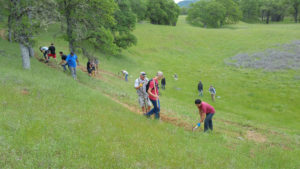 None of this (except the weather) would have happened without the support of families, volunteers. and teammates, some of whose contributions will go unmentioned here because they are too numerous to even be aware of all at once. However, here are a few notes: Linda Bishop (Liam B’s mom) is making a science of the race-day kitchen supplies; Anthony Murray (Matthew’s dad) and Lisa Yang (April’s mom) cheered on absolutely everyone; Dylan Kurzer-Ogul traveled to support the team even though she wasn’t racing; Joan Williams (Liam T’s mom) helped out at the Feed Zone; assistant coach John Culp took awesome pictures; assistant coach Jim Zahradka and Brian Bishop (Liam B’s dad) radioed Nicolas Wong-Shea (Justin’s little brother) when riders were approaching the feed zone; Dana Albert (Alexa’s dad) took and shared fun snapshots and videos; Lonnie Wong (Justin’s mom) helped in the kitchen and also contributed photos; Robin Davidson helped unload the trailer, remembering for the less-experienced where everything was to be found; assistant coach and honorary team family Andrew Tang and Pat Low (Jason, AHS class of 2015) traveled to Ft. Ord to stand in the rain and cheer everyone on; for weeks (months), Sally Basurto-Pras (Spencer and Victoria’s mom) has been getting the team ready (gear, times and places, encouragement, organization) for this first big day. There were some families who were unable to join us, but supported their riders from afar. 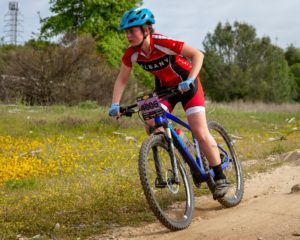 This is an expensive and time-consuming sport, as well as a lot of fun, and much of the support goes on in offices and shops, far from the thrill of riding. Thanks to Daniel for being the eye of the storm.